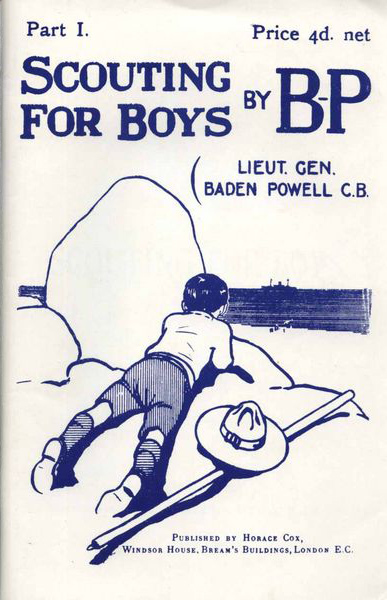 An Interview with Baden-Powell by the “Listener“ Magazine in 1937. As a matter of fact I didn’t actually start the Boy Scout Movement, because the blooming thing started itself unseen. It started in 1908 – but the microbe of Scouting had got me long before that. When I was a boy at Charterhouse I got a lot of fun out of trapping rabbits in woods that were out of bounds. If and when I caught one, which was not often, I skinned him and cooked him and ate him – and lived. In doing this I learned to creep silently, to know my way by landmarks, to note tracks and read their meaning, to use dry dead wood off trees and not off the ground for my fire, to make a tiny non-smoky fire such as would not give me away to prying masters; and if these came along I had my sod ready to extinguish the fire and hide the spot while I shinned up some ivy- clad tree where I could nestle unobserved above the line of sight of the average searcher. Somewhere about 1893 I started teaching Scouting to young soldiers in my regiment. When these young fellows joined the Army they had learned reading, writing, and arithmetic in school but as a rule not much else. They were nice lads and made very good parade soldiers, obeyed orders, kept themselves clean and smart and all that, but they had never been taught to be men, how to look after themselves, how to take responsibility, and so on. They had not had my chances of education outside the classroom. They had been brought up in the herd at school, they were trained as a herd in the Army; they simply did as they were told and had no ideas or initiative of their own. In action they carried out orders, but if their officer was shot they were as helpless as a flock of sheep. Tell one of them to ride out alone with a message on a dark night and ten to one he would lose his way. I wanted to make them feel that they were a match for any enemy, able to find their way by the stars or map, accustomed to notice all tracks and signs and to read their meaning, and able to fend for themselves away from regimental cooks and barracks. I wanted them to have courage, from confidence in themselves and from a sense of duty; I wanted them to have knowledge of how to cook their own grub; in short, I wanted each man to be an efficient, all-round, reliable individual. The men loved the training and Scouting became very popular in the regiment. In 1899 I wrote a little book called ‘Aids to Scouting‘ for soldiers. It taught them observation, or how to track, and it taught them deduction, or how to read the information given by tracks. As one instance of observation and deduction, I told how my bicycle had been stolen one night in India and how I tracked it down and discovered the thief. In the early dawn I followed the track of the bike along a hard high road, not an easy thing to do if you look down on the road, but looking along the surface towards the sunrise one saw the track quite clearly ahead of one in the dew lying on the ground. The thief had led a bike by hand because the front wheel was locked and he evidently didn’t know how to free it. His foot-marks alongside it were those of a soldiers boots, not a native’s sandal. I observed that he passed the turning which led to the Cavalry Barracks, so I deduced that he was not a cavalryman; similarly he passed the road to the Infantry Barracks, but when he got to the Artillery road he turned up it and went into their Barracks. So I had only to tell the Adjutant of the Artillery that I believed one of his men had possessed himself of a very nice looking bike with a locked fore-wheel, and in a very short time my bike was returned to me, having been found hidden under the bed of one of the men. That was one incident of many in the book to show the value of observation and deduction. When we were besieged at Mafeking, in 1900, my Chief Staff Officer, Lord Edward Cecil, got together boys in the place and made them into a cadet corps for carrying orders and messages and acting as orderlies and so on, in place of the soldiers, who were thus released to go and strengthen the firing line. We then made the discovery that boys, when trusted and relied on, were just as capable and reliable as men. Also, from experience of the Boys’ Brigade, I realised that men could be got voluntarily to sacrifice time and energy to training boys. Then my idea that Scouting could be educative was strengthened also, through the following incident. General Lord Allenby was riding to his house after a field day when his little son shouted to him, “Father, I have shot you, you are not half a Scout. A Scout looks upward as well as around him – you never saw me.“ There was the boy, sitting up in a tree overhead; but far above him, near the top of the tree, was his new governess. “ What on earth are you doing up there?“ cried the General. “Oh, I am teaching him Scouting,“ she said. She had been trained at Miss Charlotte Mason’s Collage for Teachers, and they had been using my book, Aids to Scouting, written for soldiers, as a textbook in the art of educating children. Then in 1907 I, as a General, was inspecting 7,000 of the Boys’ Brigade at Glasgow on its twentieth anniversary, and the founder, Sir William Smith, was very pleased because the total strength of his movement was 54,000. I agreed that it was a big number but added that if the training really appealed to boys there ought to be ten times that number. “How would you make it appeal?“ he asked. “Well, look at the young fellows in the Cavalry, how they enjoy the game of Scouting, which makes them into real men and good soldiers.“ “Could you re-write ‘Aids to Scouting‘,“ he wondered, “so that it would appeal to boys instead of to soldiers and make them into real men and good citizens?“ So I did that. But before writing the book I planned out the idea and then tested it. I got together some twenty boys of all sorts, some from Eton and Harrow, some from the East End of London, some country lads and some shop-lads, and I mixed them up like plums in a pudding to live together in camp. I wanted to see how far the idea would interest the different kinds of lads. I told a friend what I was doing, and said that I wanted a quiet place, out of Press reporters and inquisitive people, where I could try the experiment; she offered me the use of her property – Brownsea Island in Dorsetshire. And there we set up camp for a fortnight. I had the late Major Maclaren and the present Sir Percy Everett to help me and we taught the boys camping, cooking, observation, deduction, woodcraft, chivalry, boatmanship, lifesaving, health, patriotism, and such things. The results upon the boys in that short space of time taught me the possibilities which Scout training held for boys. So I at once set to work and wrote the handbook, Scouting for Boys, intending it to be useful to the existing boys’ organisations such as Boys’ Brigade, the Church Lads’ Brigade, the Y.M.C.A., and others. The book came out in fortnightly parts at 4d. a copy. Before many of the parts had been published I began to get letters from boys who had taken up the game for themselves, boys not belonging to the Boys’ Brigade or any other association. All the following year boys were writing to me telling me how they had started Patrols and Troops and had got men to come and act as their Scoutmasters. So we had to start a Headquarters office in a tiny room to deal with correspondence and supply equipment. I remember my Secretary wondering whether, if we laid in a stock of twelve Scout hats, we should be able to sell them all!